Adventurer / photographer Chris Bray, now 27, living in Sydney, Australia, was born into a life of adventure - sailing around the world for 5 years with his family on their homemade yacht Starship. 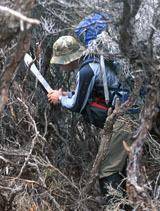 Leading an active outdoor lifestyle, when he was just 20 Chris organised and embarked on a 30-day expedition in Tasmania�s untracked south-western wilderness � complete with airdrops of supplies. Australian Geographic labelled this trek �one of the toughest foot journeys in the world� and named him, along with his hiking mate Jasper Timm, the �Young Adventurer of the Year� in 2004. 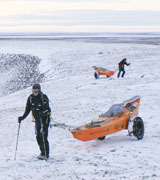 This trek was soon followed by other journeys and in 2005 Chris lead a 2-man, world-first, 58-day, unsupported expedition part way across the largely unexplored Victoria Island in the Arctic. Together with companion Clark Carter they hauled their home-made wheeled kayaks behind them for 300km, loaded with 250kgs of gear and supplies each. Crossing regions never before seen by human eyes, they filmed unforgettable encounters with arctic wolves and polar bears and documented archaeological sites while the temperature plunged to minus 38 deg with wind-chill. Only about a third of the way across the island when winter set in, they buried a flag and vowed to return. 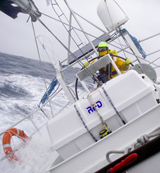 In 2008, after sailing with some mates from Tasmania across the Southern Ocean to Chile, via the subantarctic islands, Chris and Clark went back Victoria Island to finish what they started. They dug up the Australian Geographic flag and after a further 70 days alone and unsupported, they reached the most westerly point of the island, having travelled the remaining 700km through snow, ice, mud, boulders, tundra, rapids, swamp and more, hauling totally re-designed carts behind them (hindsight is a wonderful thing!). They again had unforgettable encounters with arctic wolves and an enormous polar bear � and shared the experience online with daily updates and photos to the www.1000HourDay.com website, watched by many thousands of people worldwide. Clark and Chris were awarded the Australian Geographic's 'Spirit of Adventure' medal in 2008. Chris Bray is also recognised as one of Australia's leading outdoor photographers, being the first photographer that Australian Geographic has ever sent on assignment overseas, and also being Canon's Australian Ambassador for Digital Photography, specialising in wilderness and wildlife photography. 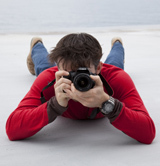 Chris now runs 'Chris Bray Photography' holding 1 day photography courses all around Australia and New Zealand, as well as photography safaris. When Chris was just 16 he established BlackJackal.com - a business retailing electronics online, and performed highly academically - coming �dux�/�first� of both Primary and High Schools. A UAI of 99.2% earned him a 5yr scholarship to study Electrical Engineering at UNSW, which he completed in 2006 with first class honours and awards in Project Management. 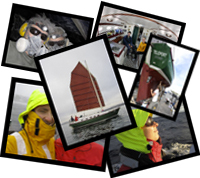 In the same year he started up his second Australian business, �Expedition Facilities� www.ExFac.com. Elected as a member of � and now Chairman for - The Explorers Club (Australia and New Zealand chapter), the youngest ever Councillor of the Australian Geographic Society, as well as being a part of the Society for Human Performance in Extreme Environments, Chris is fast forging an exciting career blending all his passions including photography, writing, film making, and applying his engineering skills to developing innovative approaches to adventuring. 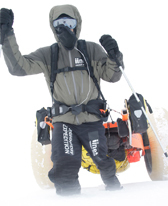 Having presented numerous lectures for the Australian Geographic Society, Air Canada, Icebreaker, Gore-Tex, The Explorers Club, adventure expos, climbing festivals and motivational talks for both high schools and primary schools, Chris hopes to encourage others to reach for their own life goals. On the side, when he�s not scaring himself with giant kites, taking photos, freediving, sailing, kayaking, bike riding, running, or generally carrying on like a pork-chop, Chris spends his time with his girlfriend Jess doing exactly the same things.